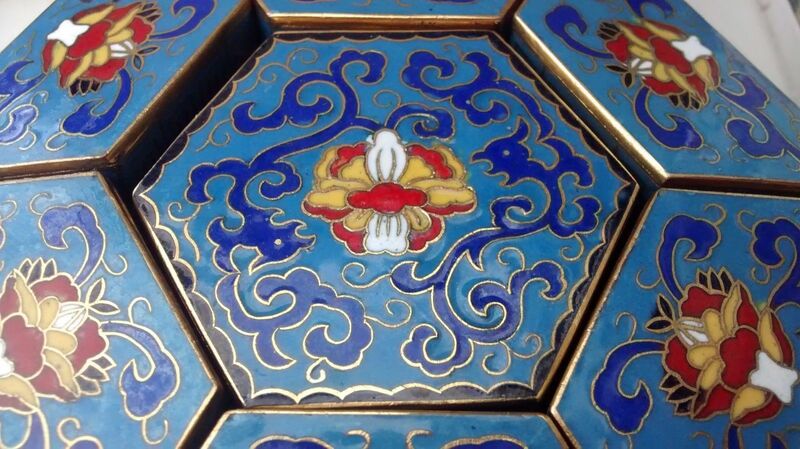 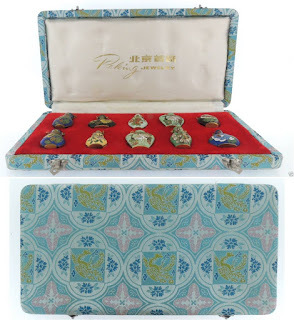 The "Gu Yi Zhai Cang" mark appears often on small pieces of Chinese cloisonne and champleve. 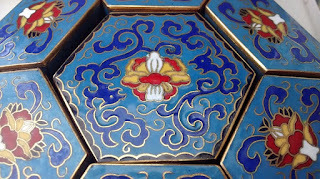 Various discussions at the Asian Arts Forum indicated that the mark was used from the 1950s onward. 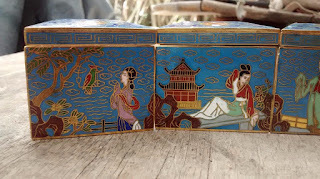 This workshop was evidently also responsible for sets of pendants, cups, small boxes from the Peking Jewelry Company. We'll start with an intact boxed set on offer from Hawaiian eBay vendor 974.1, which displays the connection between the GuYiZhaiCang mark and Peking Jewelry. 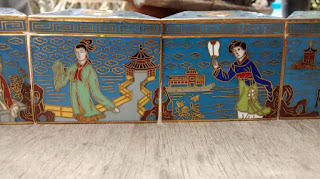 The clever and attractive design displays a distinctive feature of this type of champleve: characters that seem to be drawn from classic Chinese novels or operas, as well as famous landscape scenes such as the Summer Palace. eBay vendor les33 discovered a stash of unsold boxed sets of pendants that, from a label appearing on one of the pieces, appear to be old stock from a Korvette department store. This store chain went out of business in 1980. 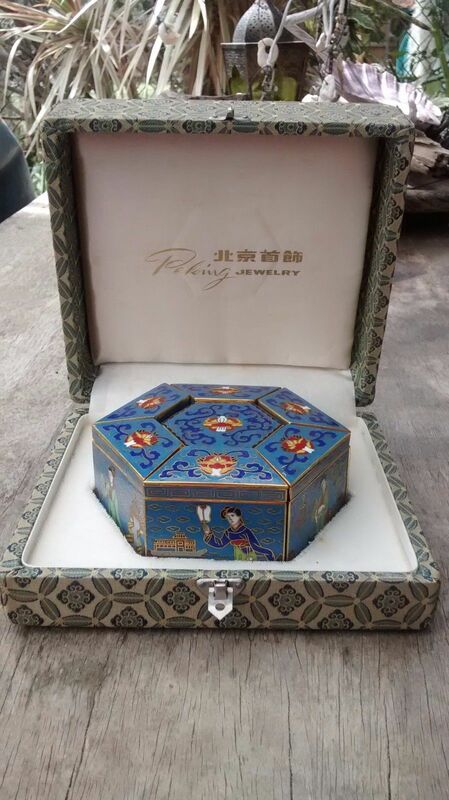 California business records indicate a Peking Jewelry Co., Ltd., was listed with a San Francisco address between August and October of 1978, when it apparently went defunct. 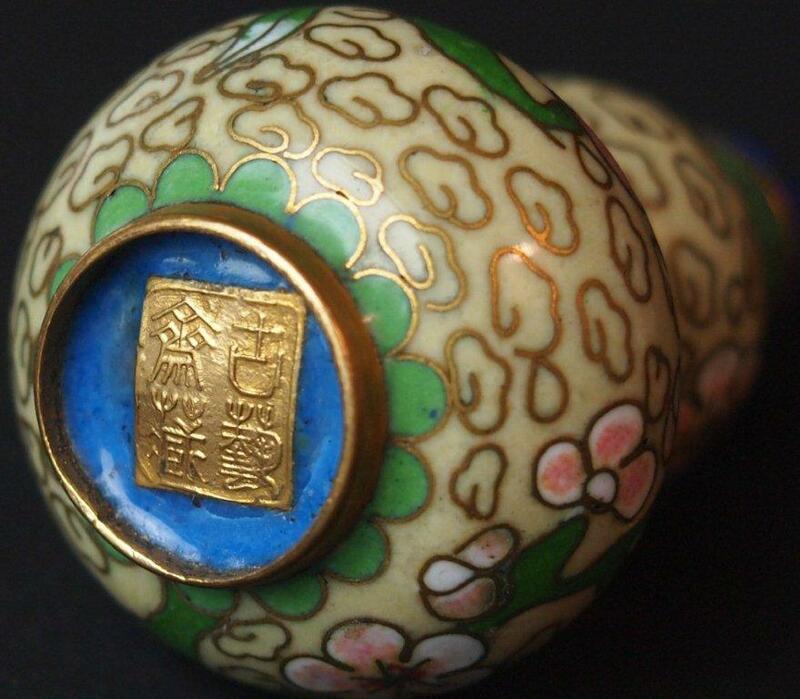 The twenty-year U.S. embargo on Chinese imports ended in 1971. Observe the JingFa clouds and flower bud. 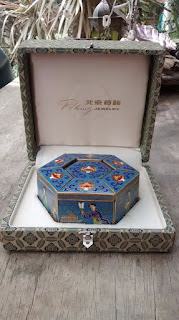 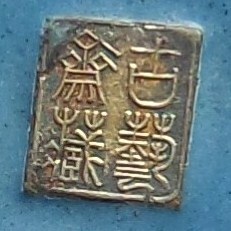 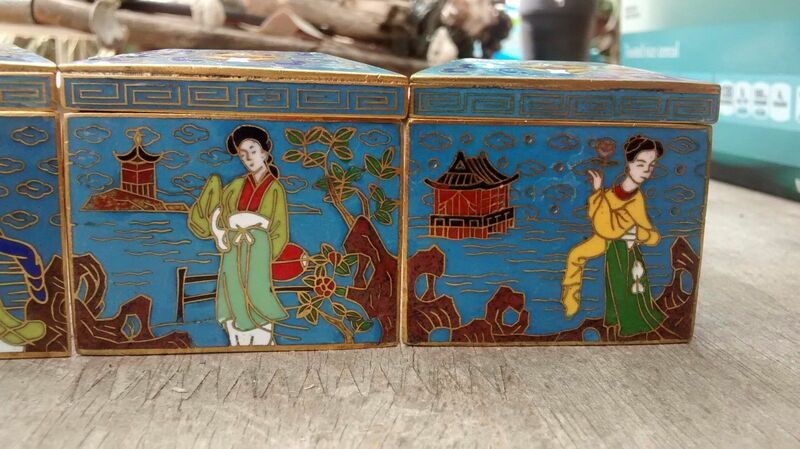 I have a number of other photos of pieces with either the Gu mark or Peking Jewelry boxed sets. 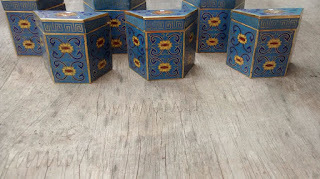 If anyone has a piece for which they'd like to compare notes, just add a comment. Evidence so far seems to indicate that these are products made from the 1950s through the 1970s. 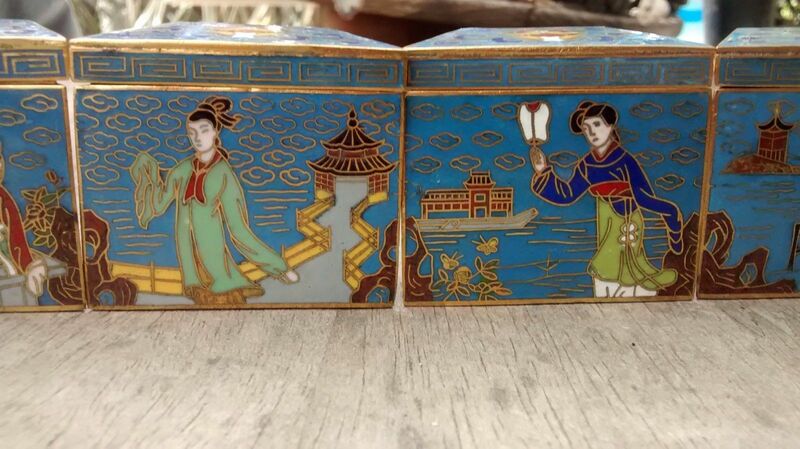 UPDATE: In a prior post about the difference between champleve and cloisonne, mention is made in a comment in the Chinese website blog www.jtlzj.net regarding the origin of machine-made enamel works in 1958. 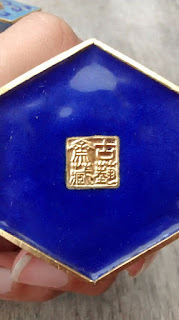 [Those who, like me, are illiterate in Chinese will find the Google translate button to be useful]. 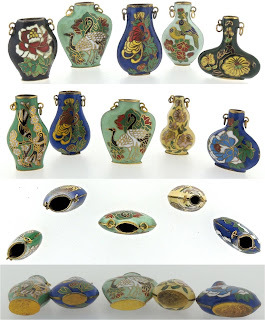 Machine-made works are described under item 8 in the list of variants of enamel types that get lumped into the general category "cloisonne." 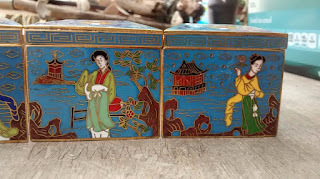 This 1958 date could be the origin date for the champleve products described in the above post?